Provides the closest shave ever in fewer strokes - with less irritation. Each blade has a patented DLC comfort edge, so Mach3 glides effortlessly across your face. A blue stripe fades away when you are no longer getting the optimal Mach3 shaving experience. 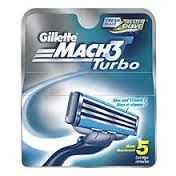 For For questions or comments about this product please call 1-800-GILLETTE or visit www.mach3.com.